The increased commercial expansion and rapid infrastructure development in the peripheral districts of Hyderabad have not only led to the spurt of employment opportunities but also the emergence of several new realty hotbeds. Here’s a peek into the top five emerging housing destinations in Hyderabad. Hyderabad has emerged as one of the most sought-after housing destinations in southern India followed by Bangalore and Chennai. Apart from affordability, several other factors such as political stability, progressive government policies, and focus on infrastructure projects have attributed to its popularity amongst commercial and residential investors. However, with city pockets getting saturated over the years, new realty corridors along the Outer Ring Road (ORR) such as Nallagandla, Kompally, Chandanagar, Tellapur, Kokapet have become the realty cynosures. Located along the National Highway (NH) 48, Nallagandla has emerged as one of the most preferred housing destinations in West Hyderabad. The area is merely three km away from the University of Hyderabad and eight km away from Gachibowli that comprises a host of reputed corporate giants such as Infosys, Wipro and Microsoft. Other notable areas such as Madhapur, Kondapur, HITEC City, and Banjara Hills are also easily accessible through ORR. Nallagandla also boasts of a variety of residential properties ranging from budget apartments to luxury villas that suit buyers across segments. Besides, the lush green cover and scenic spots such as Nallagandla Lake further contribute to its popularity. Kompally in the northern suburbs is another popular micro-market that is evolving at a blistering pace, thanks to its accessibility. The area ensures a hassle-free ride to the IT hub of HITEC City and other pockets of Nizampet, Kukatpally and Miyapur. Besides, the area is famed for its logistics and warehousing industry which has immensely influenced the residential growth in the region. Overall, for those who are on the lookout for a self-sufficient residential destination, Kompally is an area worth considering. Apart from the strong connectivity network, the area also unleashes numerous low-cost housing arrangements, multiple restaurants, souks, health care centres and shopping complexes in proximity. Offering hundreds of affordable projects, Chandanagar has risen to popularity principally owing to rapid commercial advancement in its surrounding. Presence of several reputed companies in the vicinity including Bharat Heavy Electricals Limited (BHEL), Bajaj, Reliance, Wipro, Capgemini, Polaris and Honeywell, among others, has created an upward pressure on both the rental and the capital markets of Chandanagar. Topnotch colleges such as Indian Institute of Technology (IIT), Hyderabad and Indian School of Business are also just 40 minutes away from Chandanagar. Besides, red line metro connectivity at Miyapur (5 km) is another attractive factor that has thrived the area’s realty growth. Overall, Chandanagar is a steadily growing micro-market and holds strong investment potential. Tellapur offers several property options to homebuyers. 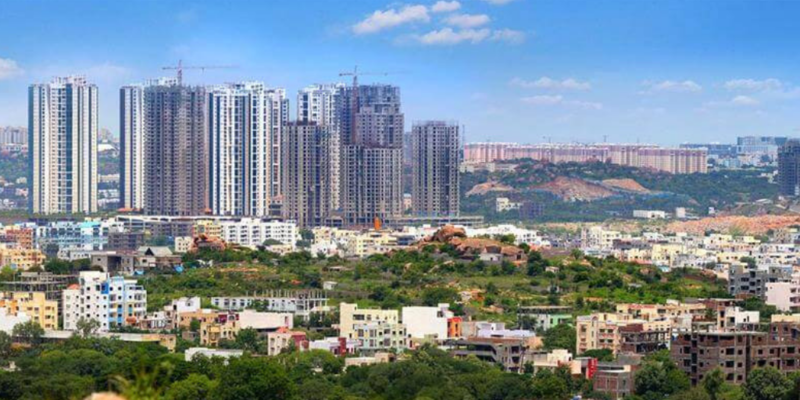 The residential demand in the area is mainly driven by working populace of Madhapur and Gachibowli, and hassle-free connectivity to ORR. The area unfurls a host of residential options across budgets. However, properties priced between Rs 40 lakh and Rs 60 lakh outstrip the supply of other categories. Some of the famous landmarks in the area are Manthan International School, Greater Hyderabad Municipal Corporation (GHMC) urban forestry nursery and Tellapur Lake. A Multi-Modal Transit System (MMTS) network is also underway on Ramachandrapuram to Tellapur railway station which will cater to the growing needs of the IT corridors. Once completed, the project will further trigger realty growth in the area. Juxtaposed along the ORR, Kokapet has predominantly benefitted on the back of its vicinity to the Financial District and Gachibowli. It also boasts excellent connectivity to Narsingi and Nanakramguda via ORR. LB Nagar in the South and Dilshukhnagar in the East are also easily reachable from Kokapet. Presently, the area brags a well-maintained social infrastructure, and a slew of residential projects to choose from. Increased proximity of Kokapet to Gachibowli and Financial District via ORR has triggered rampant construction in the area. Therefore, it is essential that homebuyers do their due diligence before investing in Kokapet. While effective measures are undertaken by the government to curb illegal construction, it is prudent to do necessary background verification of the builder and the project.